BigUpRadio.com proudly presents the all new weekly reggae dancehall radio show called "Green Lion Radio Show." The Green Lion Reggae Show is a one hour escape into reggae dancehall culture every week. Hosted by DJ and producer Zeke Stern, the Green Lion Reggae show features speciality programming in which Stern curates the program based around a unique theme, exclusive pre-releases from the Green Lion catalogue, one on one interviews and Green Lion's signature 'LP Clash' where seminal albums in the history of the music face off and the listener can decide who wins. 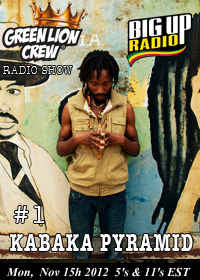 This kick off show #1 will feature an exclusive interview with up and coming reggae artist Kabaka Pyramid! Don't miss this show! Tune in every Monday on the dancehall station at bigupradio.com. The show times on Mondays are: 5am, 11am, 5pm and 11pm Eastern Standard Time. The Green Lion Reggae Show, keeping you up to the time and close to the roots. Keron "Kabaka Pyramid" Salmon is a multi-talented artist and producer coming straight from the streets of Kingston, Jamaica with a unique musical style blending the lyricism of Hip hop, with the energy and melody of Reggae and Dancehall. He is based out of the Bebble Rock music camp and through his liquid and hypnotizing delivery spreads the positive messages of spirituality and conscious evolution that forces you to listen. The name "Kabaka" is Ugandan for "King" and Pyramids are thought by the artist to house the mathematical proportions of Universal Laws that are eminent in the creation of this universe. His passion for music began at early age when he would change the lyrics to popular songs and record his own version on his mother's tape recorder. What began as a humorous venture was actually a stepping-stone for the artist we know today. Reggae music has always been a strong influence on the Kingstonian lyricist, but during high school it was Hip Hop music that captivated him; reciting his favorite Canibus or Inspectah Deck lines constantly. The influence of both genres can be easily detected as he seeks to find the perfect fusion of the two cultural expressions.